It was just supposed to be a visit to the museum… nothing more. But it became something more, purely by accident. Oh sure, there’s lots of mind-numbing activities one could enjoy in Las Vegas, and for sure The Artist and I partake in many of them, both banal and bizarre. But come on... a museum of natural history? IN LAS VEGAS?!!?!?!?!?! But it’s true. There we were, on one of our many trips to that dazzling burg in the blanched desert to celebrate our wedding that took place on The Las Vegas Strip back in the far-away year of 1986. I know, Las Vegas in July is just insanely hot, but we really don’t spend that much time outdoors anyways, and we both hate blistering by the pool. So to make the anniversary trips more fun, The Artist does something that always makes for an interesting and enjoyable time for when we’re not sexing up in our room or playing the slots. In the weeks prior to an upcoming journey into the Vast Hotness, she searches the intertubes for alternative LV activities. There’s lots of really cool things to do that don’t involve slot machines, alcohol or endless foot travel. Recent side trips included the Ethel M Chocolate Factory (she of the M&M Mars Family), the Pinball Hall of Fame (500 machines from vintage to modern), the Bellagio Hotel Gallery of Fine Art (world-class art is there if you can find the place), Frankie’s Tiki Room (a genuine hard-core tiki lounge, darkest bar I’ve ever been in), and the King Putt indoor/Egyptian-themed/black-light miniature golf course(!?!?!). This trip found us sweating outside of the Marjorie Barrick Museum of Art on the campus of UNLV, which was hosting a gallery exhibit of ceremonial masks from the indigenous peoples of the West spanning almost 2500 years. She thought it sounded intriguing, so one stifling weekday morning after we roused from the hotel room sexing bed we made our way out to the campus, the place literally abandoned for Summer break. We arrived just before the museum’s 10AM opening, which allowed us the chance to walk the small but excellent desert foliage garden out front, grabbing whatever shade was available. Natch, we were the first (and only) people to walk in when they unlocked the doors and were almost knocked over by the arctic air blasting from inside. The gallery exhibit of ancient masks was simply breathtaking. Displayed on a timeline, it was stunning to see how long-dead hands had lovingly formed these avatars of ancient peoples, fabricating and decorating them in a way that would exalt their ancestors, their spirits, themselves. But something else grabbed my attention, dragged it away from those beautifully symbolic masks. It was sitting there, in the literal center of the gallery, waiting just for me. 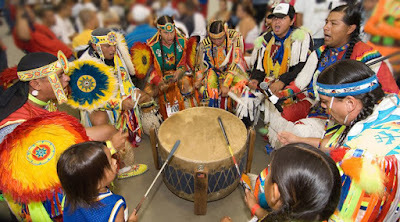 A giant American Indian pow-wow drum, easily 4 feet in diameter. The moment I saw it, drumsticks leaning all around the side, surrounded by empty benches, I looked over at The Artist who was already looking at me with an expression that said 'You're not really going to, are you?' She knew what was in my head, but she also knew it would be impossible to prevent the inevitable. Remember, we're the only people inside this museum gallery on a weekday morning. I walk up to the drum, sit down, grab one of the drumsticks, and begin to softly drum. "bum bum bum bum bum bum bum bum bum bum bum bum bum bum hum bum..."
"BUM bum bum bum BUM bum bum bum BUM bum bum bum BUM bum bum bum..."
That's a fake drum cadence, and only a very few non-American Indians know the difference. I sat there, drumming with my eyes closed, hearing the echoes bounce around in the empty gallery, filling the place with an ancient sound, and in that instant I was transported through time and space to other moments in my life. I traveled to my performances of the Eagle Dance at many Boy Scout ceremonies celebrating a Scout's achievement of the Eagle Badge, the highest award in Scouting. I wore my dance costume without the large feather bustle on my shoulders or the horsehair roach on my head, replaced by a set of feathered eagle wings and a ceremonial Eagle headdress, dancing and spinning and flying across the stage, at one with the moment. I traveled to one of the many Indian pow-wows our Order of the Arrow dance team was invited to attend, REAL pow-wows replete with women and children and youth and elders, all dressed in their finest costumes, dancing around and around and around the drummers in the center, all drumming and singing ancient songs of the Original Americans. I even met Iron Eyes Cody once and he shook my hand and thanked me for being there. I danced for hours in those circles with Original Americans. 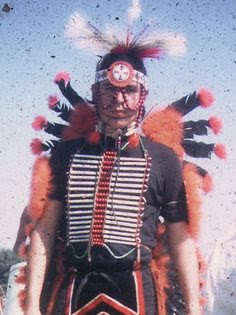 I traveled to another pow-wow, dressed in my completely handmade costume, a Modern Oklahoma Fancy Dancer, with my bells ringing and fringe flying and feathers swooping and my head roach tossing back and forth, and then the drumming became more insistent and we youth, we Fancy Dancers, began to dance even faster to keep up with the drumming cadence. Faster and faster we danced and spun to keep up with the beat, and on each heavy beat we'd either bounce in the air or drop to the ground and bounce right back on the beat, each and every time, faster and faster and faster. As is typical of time travel, I was only drumming there for a few minutes, but it felt like I'd been there for much longer. Eventually The Artist begged me to stop because I was prolly getting the docent angry, so I stopped drumming, put down the stick and waited for the echoes of the past and present to fade away. We finished our gallery visit and decided to head out to another weirdo non-gambling Las Vegas activity. As we started to leave, I veered off and went over to the museum office where the docent who let us in was doing some paperwork. Me: (peeking my head into her office) "Hi there... many thanks for the really great exhibit. I'm glad we made the trip out here." Her: "Oh, you are most welcome!" (Brief pause) "By the way, was that you drumming in there?" Me: (highly embarrassed) "Ummm... yep, that was me. Hope I didn't make too much noise on this quiet morning for you." Her: "NO NO NO... your drumming was amazing! It's nice to hear someone drum who knows what they're doing with that wonderful instrument. Thanks for that!" Out into the Stoopid Hot we walked, into the sunshine and mindless excess that typifies Las Vegas. However, I left something important behind, something that was a part of me, and I was glad to leave it. I had punched a hole in the time/space continuum, stepped through and went for a stroll with a drumstick in my hand, an ancient beat in my heart, and the memories of a joyous time paying homage to the Original Americans in my mind's eye. That hole was still in there, exactly where I left it, waiting for someone else to peek through. I will always be grateful for those formative youthful years communing with Indian spirits at pow-wows, dancing for hours around and around the drummers, singing their ancient songs to their ancestors, who were swirling all around them. I will always be grateful for the chance to participate in such a singular and special activity, accorded to me by the Boy Scouts of America, the Order of the Arrow, and My Father, without whom none of it would have been possible. The same Father who spent hours and hours fabricating my costumes while I sat at his side, watching and reveling at his skill with needle and leather and feather and bell. The same Father who spent countless hours carting our dance team around from one show to another, giving up his time and energy to allow us to fulfill our Scouting dreams. The same Father who cheered me on at competitions, soaking in the success when I won, consoling my broken heart when I didn't, but always showing me that my efforts were valued nonetheless. 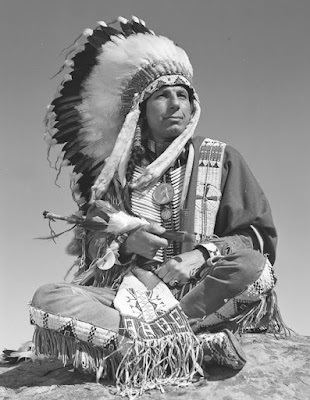 The same Father who watched as I took possession of a set of amazingly beautiful Fancy Dance feather bustles hand-made by a Real Indian, complete with Cloud Eagle feathers, from the son of the man who made the bustles and wanted to see me compete in them. And yes, the same father who I railed against as I grew older and decided I didn't need Scouting or Indian dancing or any of that stuff, but stayed silent anyways. That Father. The Best Father Ever. To this day, I am always thanking that guy for all the things he gave me as a growing, obstinate, fickle youth. Especially the chance to dance with feather and bell, around and around the giant drum, honoring The Original Americans.